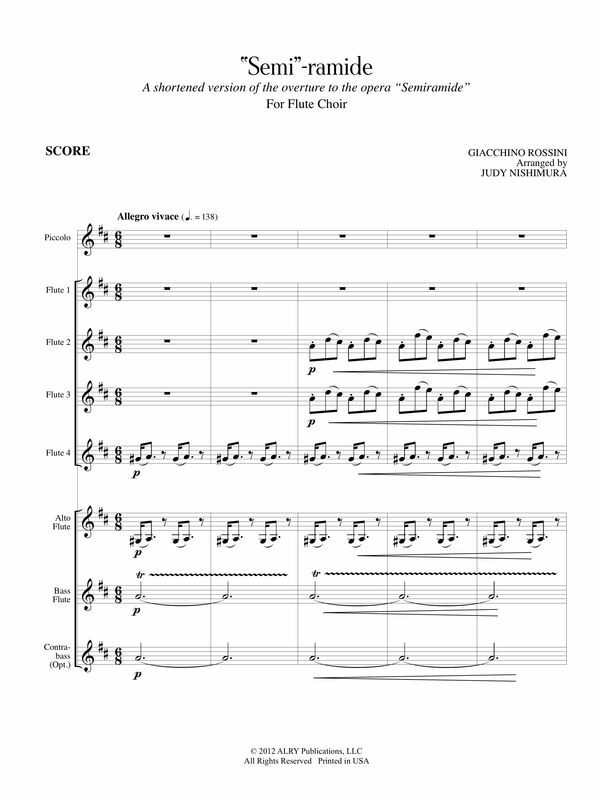 Everybody likes to play the crammed-with-notes Rossini overtures, but as a vehicle for flute choirs, the lack of tonal variation tends to make it more interesting for the players than the audience. My answer is to pack all the good stuff into a smaller package. The original overture, nearly 12 minutes long, has been cut in half...hence the name, "Semi"-ramide. All the great flute and piccolo solos have been retained, but the interminable repetitive crescendo passages have been pared down to move the piece along. It's all the fun with half the calories! Flute Talk Magazine -- "As with the original, it is imperative that the fast moving parts align exactly and the accompanying figures are light and bouncy. The addition of optional contrabass flute is desirable for better balance...Both players and audiences will enjoy this lively work."